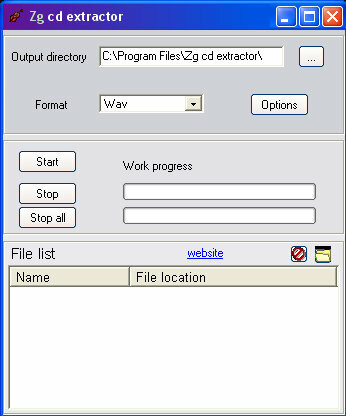 Zg CD Extractor is a free Cd to wav/mp3/ogg/ape/flac ripper. Highly customizable you can for example change the bit sample, and the sampling frequency for wav files or get stereo or mono files. For mp3 you can change aswell mp3 tags, and select common options to these tags for several files. Mp3 files are encoded using the lame library and it allows to use variable bitrate as for ogg files. The last but not the least are Ape and flac encoding. ...... The last but not the least are Ape and flac encoding. These two lossless formats are similar to wav but they take less space on your harddrive, since they suit more for modern applications and current configurations. This software is free and no password or serial number is needed to use it freely. Qweas is providing links to Zg CD Extractor 1.01 as a courtesy, and makes no representations regarding Zg CD Extractor or any other applications or any information related thereto. Any questions, complaints or claims regarding this application Zg CD Extractor 1.01 must be directed to the appropriate software vendor. You may click the publisher link of Zg CD Extractor on the top of this page to get more details about the vendor.